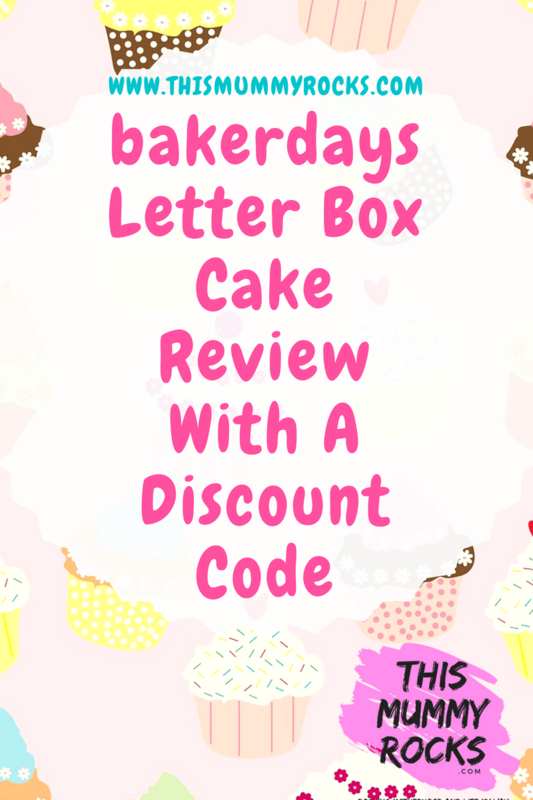 bakerdays Review – Celebrate With Cake…With A 15% Off Discount Code! I recently came across bakerdays and was offered the chance to review one of their 5 inch Letterbox Cakes. So I snapped at the offer. I mean a cake that fits through your letterbox?! Intrigued, I wanted to know more. Surely a cake can’t fit through the letterbox?! Can it? When the cake arrived I was impressed that it actually did fit through the letterbox! I know, it’s a ‘Letterbox Cake’, obviously it will fit through the letterbox! BUT it looked just like the contact lens postal boxes, you would never realise there was a cake in the box! This would be great to send as a gift to anyone as they wouldn’t need to be in to take delivery of the cake – The ideal surprise gift! The box DOES fit through a letterbox! When I opened the postal box I was greeted not just with a cake but with a lovely presentation tin that contained the cake along with a note card and a packet of Love Hearts. Everything your cake recipient would need to celebrate their special occasion! The presentation and delivery of the Bakerdays Letterbox cake cannot be faulted. Ordering online was easy and straight forward. bakerdays state that if you order before 2pm on a weekday, they can deliver direct to your door the very next day. Weekend and worldwide delivery options are also available, so you can send cake to almost anyone, anywhere. Bakerdays use the most advanced printing technology and best quality ingredients to ensure the highest standard. bakerdays offer a variety of cakes such as traditional sponge, lemon drizzle and chocolate. Not only that but they offer gluten free, wheat free and dairy free options so that everyone can enjoy a slice. Creating your very own personalised cake has never been easier with bakerdays. We requested a chocolate cake. When we cut into the cake, the knife glided straight through it. You could feel the softness of the sponge cake. It was smelt delicious. A strong luxurious scent of chocolate rose up from the cake. You could tell it was freshly baked. It smelt divine. The cake itself was moist and soft, with a thin layer of chocolate buttercream between the cake and icing. It was scrumptious. A must for chocolate lovers. The cake is definitely a winner for myself and husband. We aren’t sharing this one with the kids! Baker Days cakes have a best before date of at least two weeks from delivery and just need to be stored in a cool dry place – I would never usually expect a cake to last two weeks so this really is a fantastic shelf life. Disclosure: The above cake was sent to me for the purpose of this review however all opinions are my own.